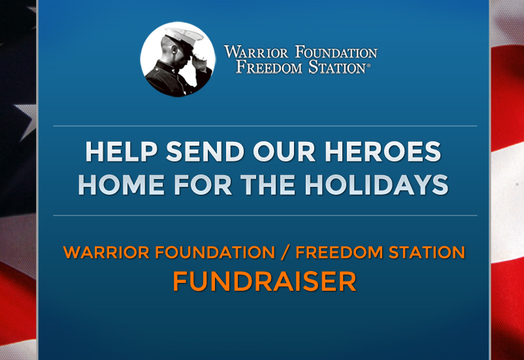 HELP SEND OUR HEROES HOME FOR THE HOLIDAYS 2018 - Warrior Foundation - Freedom Station | CommitChange | We help organizations raise more money, more sustainably. During the Holiday season the Warrrior Foundation/Freedom Station collects donations to send our injured warriors home for the holidays. If an injured warrior is unable to travel the Warrior Foundation/Freedom Station arranges travel for family members to be with the injured warrior during the holidays. Through the generosity and kind spirit of donors thousands of injured warriors have enjoyed the holidays with their families and loved ones. It's a simple way all of us can serve those who bravely serve us! In addition to sending our warriors home for the holidays, The Warrior Foundation - Freedom Station helps transition our military men and women back to civilian life. WARRIOR FOUNDATION - FREEDOM STATION MISSION STATEMENT - Warrior Foundation - Freedom Station aims to be the leading force in assisting, honoring and supporting the military men and women who have so bravely served and sacrificed for our country. We are committed to supporting our warriors in a variety of ways, providing quality-of-life items, support services and transitional housing designed to assist them and their families during recovery. We have FOUR GROUPS of Warriors which the Foundation will now, with your generous support, be able to continue helping. Our FIRST GROUP is the S.I. 's or Seriously Injured who come home from Iraq or Afghanistan with immediate needs, both medical and emotional. The SECOND GROUP of Warriors have suffered from exposure to blast from IED's, some even from as many as seven different explosions. Those in our THIRD GROUP have been going through physical therapy and occupational therapy for 4 years or longer. Our FOURTH GROUP is those Warriors who have been medically retired and remain in our community.We continue to assist these great citizens as they transition back into civilian life.